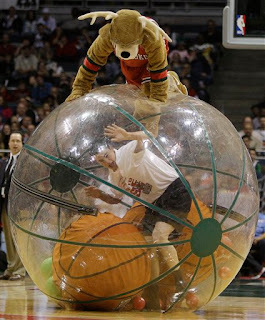 Bucks Update: Roll In 4th To Beat Pacers 121-103 ~ The Bucky Channel - The World of Sports from Wisconsin's Perspective. I'm not going to write a usual Bucks post because I saw nothing of the game. Originally I was planning to attend, but that fell through, and since the game was not on TV I really have nothing for you other than the box score could provide. Also I'll just mention that Bogut and CV had double-doubles with Bogut's being of the 20 points and 20 rebound variety and CV had 26 points and 10 rebounds with 3 blocks to boot. Michael Redd led the Bucks with 27 points. Wisconsin native Travis Diener did not play in his return to Milwaukee due to a sore foot. Milwaukee(10-15) go back on the road Monday night against the Miami Heat(12-11) at 6:30. The game will be televised on FSN. TBC's Buck of the Game: Andrew Bogut - 20 and 20 with 2 blocks. Pretty schniiisch.